A book of offices (special prayers for each day) and other prayers, this book was illuminated by the painter Hermann Scheere. Scheere may have been German, but his style suggests that his artistic background was Flemish. Certain features of its decoration reveal his continental background and suggest that he decorated this book soon after arriving in England. It presents several unique or early examples of subject matter and text. Provided with a calendar, it includes prayers for feast days and ones special to certain saints. Several psalms are presented on this page. The miniature is inspired by Psalm 66 (67), 'May God be gracious to us and bless us and make his face shine upon us.' It shows God the father as a white haired, bearded man who holds up his right hand in a gesture of benediction. The picture set into the column of text is a continental feature. 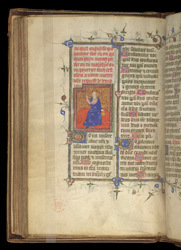 English introductory miniatures usually were placed within the first letter of the text.